In the author’s note of a historical novel I read this week, I learned that a homing pigeon named G. I. Joe saved the village of Calvi Vecchia, and the British soldiers who had wrested the village from German occupiers, during World War II. G.I. Joe received the Dickin Medal for gallantry. He died in 1961, and is now displayed at Fort Monmouth, NJ. Calvi Vecchia, about 25 km northwest of Caserta, was occupied by the Germans, and Allied air forces were requested to help dislodge them. British infantry were able to liberate the village ahead of schedule but weren’t able to radio the allies’ airfield to call off their attack. G. I. Joe was released with the message, and carried it to the airfield twenty miles away in just twenty minutes, arriving as the planes were preparing to take off — just in time to prevent the bombing of Calvi Vecchia. Award-winning author Kate Breslin features homing pigeons in her WWI novel, Far Side of the Sea. Her story, set in 1918, takes British Lieutenant Colin Mabry, struggling to recover from shell shock and injuries, back into France to help the French girl, Jewel, who had saved his life the prior year. With twists and turns like the Amalfi coast road, the plot pulled me along as Colin met Jewel’s sister Johanna. Together they searched for Jewel and her father, encountered spies from all sides, and questioned who they could trust. While Johanna longs to find the only family she has left, Colin seeks God’s purpose and plan for his life after military duty. Breslin’s colorful writing, and the satisfying conclusion, make this a book I recommend! The book itself has no link to The Italian South, but I was intrigued by Breslin’s mention of G. I Joe in the back matter. 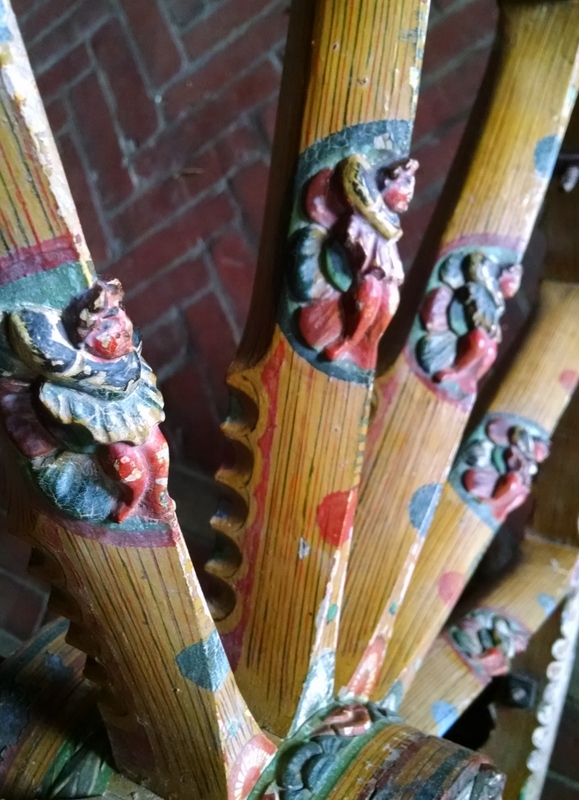 I’m always delighted to find tidbits of southern Italy in unexpected places! These first days of 2017 have been frosty where I live, and this recipe for pasta e fagioli seems like the perfect supper tonight. Do you have a simple go-to Italian supper? Please share in the comments! 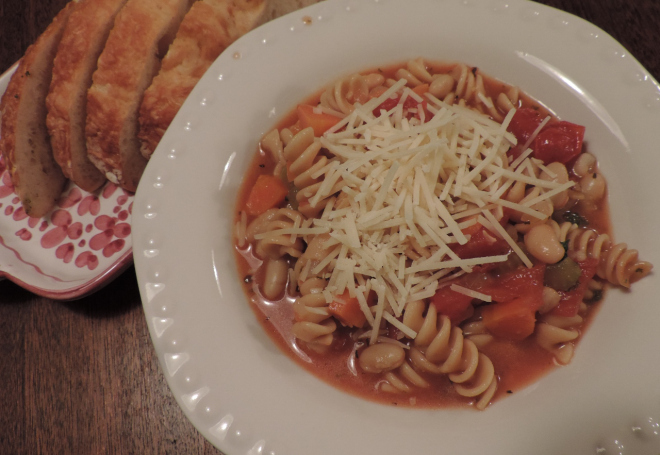 The pasta e fagioli I made while writing this blog post. As I’m writing this, the weather is damp and chilly, and the mid-winter is a great time for pasta e fagioli, an Italian peasant dish that has as many versions as there are Italian kitchens, I think. It might be Italy’s best known meatless meal, although many recipes add meats like pancetta, diced ham, salt pork, or bacon. Today I’m making a meatless version, but not truly vegetarian, since I’m using chicken broth. One thing I like about pasta e fagioli is the use of basics. I am rarely without onion, carrot, celery, and garlic, a can of chopped tomatoes (if I don’t have fresh ones to use), a can of beans, and some pasta. We had an early warm spell this year in March and April, giving a boost to fruit crops in our area. That includes my honey fig tree, which produced several dozen figs, and is on it’s way to a second crop–if fall weather lasts long enough to ripen them. In Sulmona, Italy our landlady for a few weeks, Signora Giusseppina, brought us bags of fresh figs and hung them on our door. They were dark, purplish and dripping sweetness. I’m in a different climate, and my honey figs are pale green even when they ripen. The figs I have already picked are delicious, and here’s my favorite way to prepare them: Wash them off, trim off the stem, and cut in half from stem to base. The skin is edible, and pretty difficult to remove from a ripe fig. Melt two or three tablespoons of butter in a pan on medium-high heat, and place the figs cut side down in the butter. Let them fry until they begin to brown. It won’t take long. Turn the heat down a smidge, and add a little orange juice. Just a couple of tablespoons, from a fresh orange if you have on (though I am not a purist about it). Let that sizzle in the pan for another couple of minutes. Now spoon those babies out onto a plate and eat them. I especially love them for breakfast, dessert, or as a side with lunch or dinner. In other words, anytime at all! Now I would like to find a savory fig recipe–so, readers, what do you suggest? 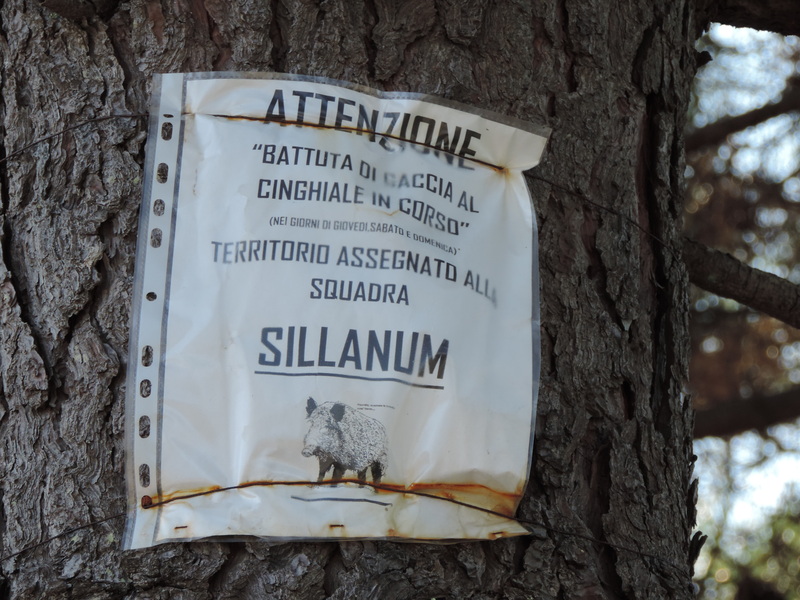 We did not see any of the said wild boars in the road, however we did enjoy eating them a few times in our Italian travels. The first time, I asked the friend we were dining with where the restaurant acquired the wild boar. Apparently there are wild boar farms. But there are also wild wild boars which can be hunted. On this road. On Fridays, Saturday, or Sundays. You never know where the Italian south is going to show up. My daughter and her husband planned a family outing when I visited them this month near St. Louis, Missouri. Grant’s Farm looked like a family-friendly place that their toddler daughter would enjoy, and the history of the place appealed to the adults. The property was given to Ulysses S. Grant by his wife’s parents when they married, and their cabin, built in 1855, is still on the property. Grant also built an interesting fence from Civil War rifle barrels. In 1907, August Busch bought the property and developed it as a family getaway in the style of the rich and famous. As the fortunes of Anheuser-Busch Brewing Company rose, the Busch family developed world class riding stables, and gathered exotic animals. The friends they hosted loved the place so much, eventually the family decided to open part of it to the public. Since the day we visited was rainy (to put it mildly) we were glad to browse the Bauernhof, a building where several horses were stabled. Trophy cases filled with blue ribbons and silver engraved plates and bowls reflected the Busch family’s horsemanship. 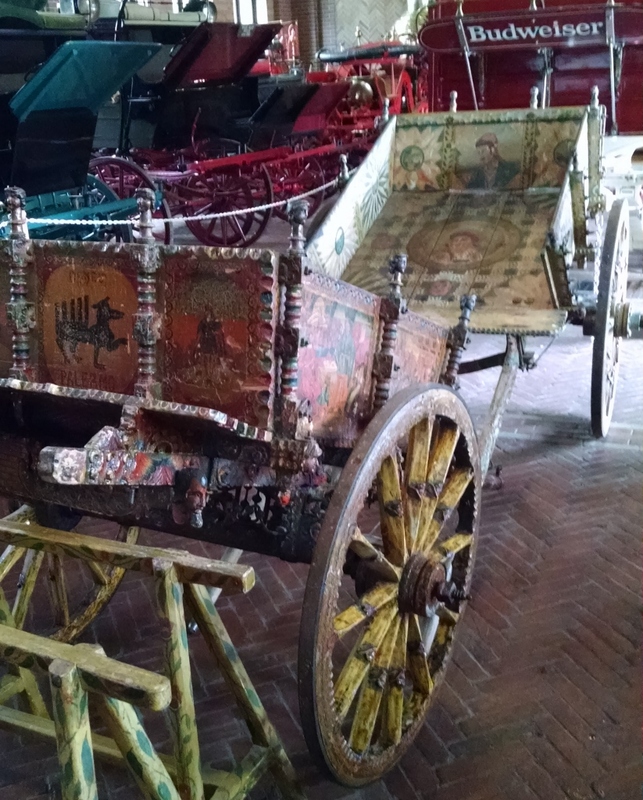 Another wing held their collection of carriages, wagons, and sleighs–dozens of horse-drawn vehicles. 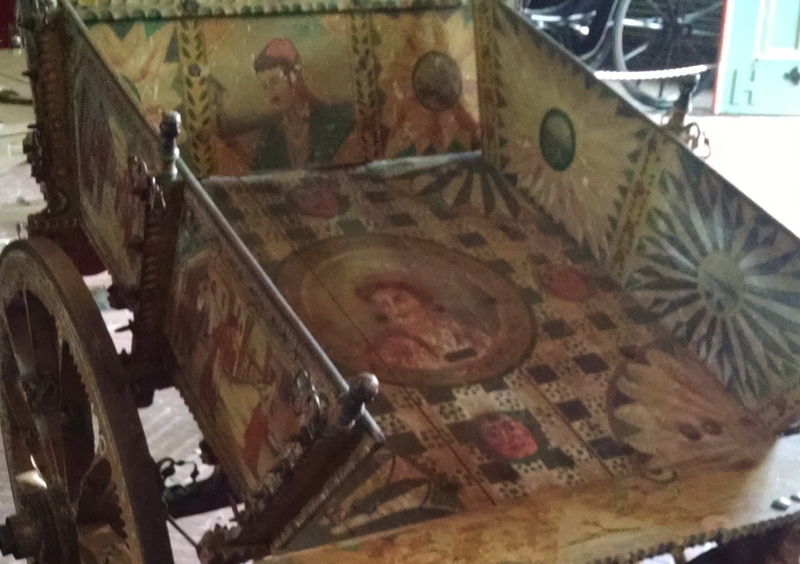 And there I found the unexpected, the Sicilian surprise: A beautiful pair of Sicilian wedding carts dating from the 1700s. Traditionally pulled by donkeys, the carts were the smallest vehicles in the collection. 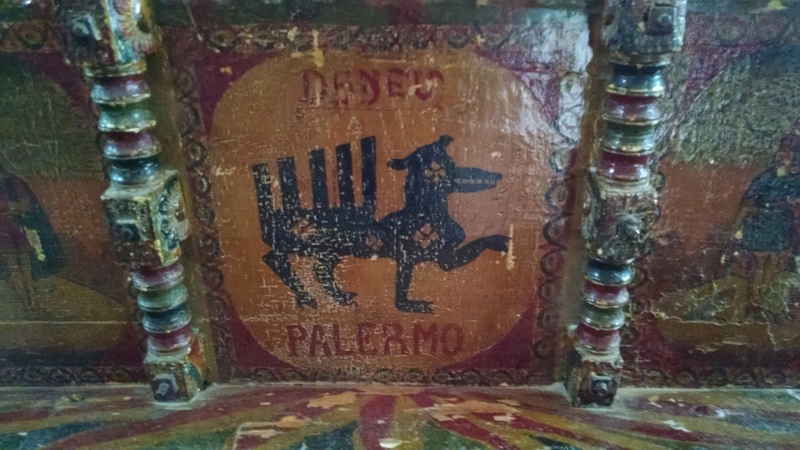 I hope my photos give you a glimpse of the Sicilian history they represent. One is for the bride and one for the groom. 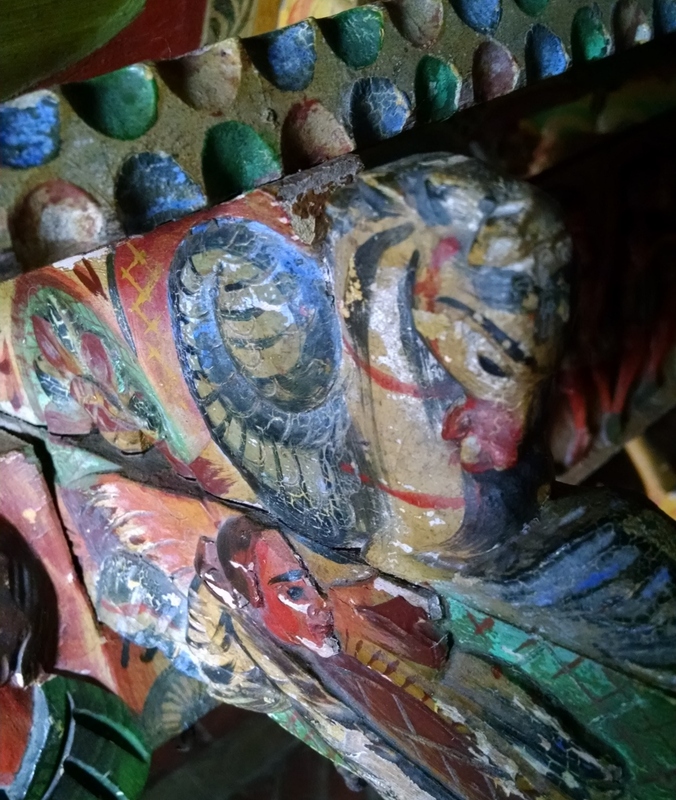 The detailed carving and bright color stood in high contrast to the gleaming black carriages and bright red Budweiser wagon nearby!